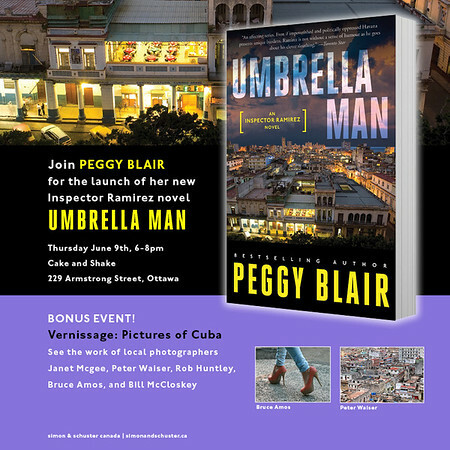 Book launch of Peggy Blair's new Inspector Ramirez novel, Umbrella Man combined with a gallery show of Cuba Photography. An exhibit by several photographers including myself in support of the launch of Peggy Blair's new Havana-based Inspector Ramirez novel Umbrella Man at Cake and Shake, 229 Armstrong Street, Ottawa (Parkdale Market Area). Book launch and photography vernissage is on Thursday, June 9th, 2016 from 6-8 pm. Photographers include Janet McGee, Peter Waiser, Rob Huntley, Bruce Amos and Bil McCloskey.